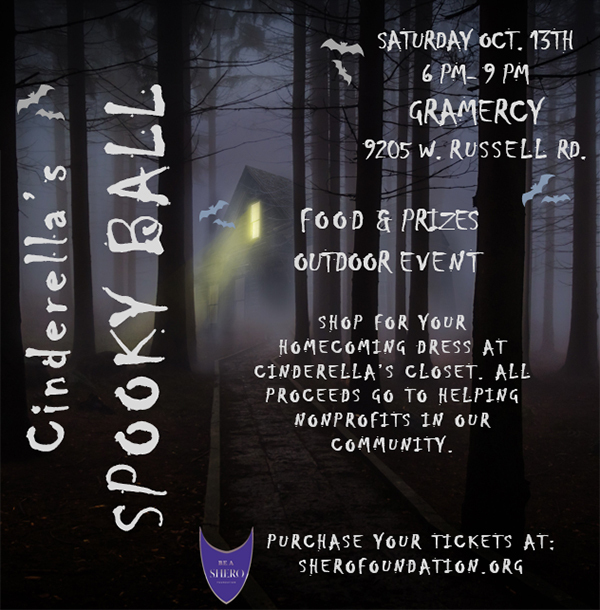 “Cinderella’s Spooky Ball” a magical night with a Halloween twist. Proceeds will benefit causes the Teen Board supports through BE A SHERO Foundation. Your ticket gives you access to our Spooktacular Food, gets you on the Dance Floor, allows you to Play our Outdoor Halloween Games, gives you one Raffle Ticket and enters you in our Costume Contest for a chance to win one of our Amazing Prizes! If you don’t have anything to wear, don’t worry! We will have plenty of gowns available to rent or purchase with our on-site Pop Up Shop! “Cinderella’s Closet” will give you the stunning look you want this season at a fraction of the cost! These are Gorgeous Gowns you can wear to Our Ball, an upcoming Dance, or any Special Occasion. Every dress purchased benefits a great cause! Keep up with BE A SHERO Foundation to see what we do! And remember that when shopping for your next Homecoming or Prom dress. The party starts at 6pm so don’t be late! Grab your friends and join our Best Group Costume Contest for a chance to win our Grand Prize! Games like Life Size Janga, Fun Contests, and so much more! Tickets are limited and will only go to the first 100 people, after that we will not be able to let others into the party so buy your ticket today!